The grape harvest this year in Oregon came at least a month ahead of schedule, and coincided nicely with the run of coho salmon that were gleaming in fishmonger's cases around town. 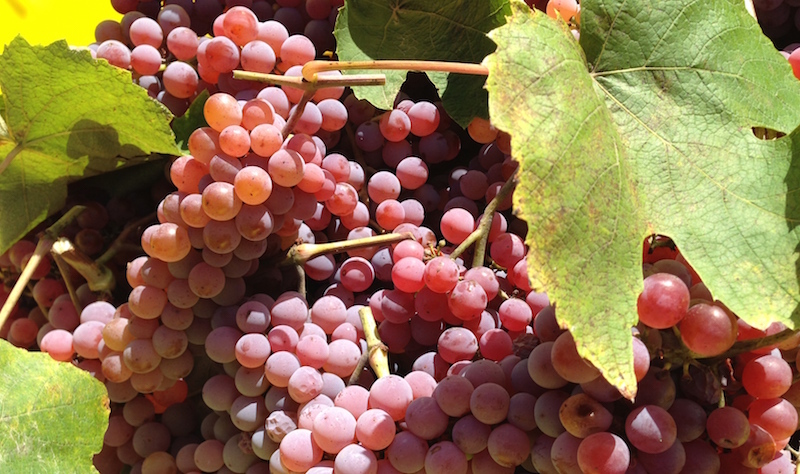 With her grape vines bearing scads of clusters—it's been a very good harvest this year despite the lack of rain—Ann looked up a simple recipe she'd seen in Sunset magazine that called for roasting grapes and fillets of salmon, then serving them on a bed of dressed arugula. Lucky for us she also thought to invite Dave and I for dinner, so now I can share her brilliant inspiration with you. And, note to cooks, please try to use local grapes from the farmers' market or a store that carries local produce with this recipe. The giant red or green grapes in bags at the supermarket just don't have the intensity of flavor that'll make this dish sing. And if it's okay with the farmer, don't forget to do the chomp test (or, barring that, just taste one or two)! Preheat broiler with a rack set about 3" from heat. Toast pine nuts in a medium frying pan over medium-low heat until golden, stirring often, 4 to 7 minutes. Pour into a bowl and let cool. 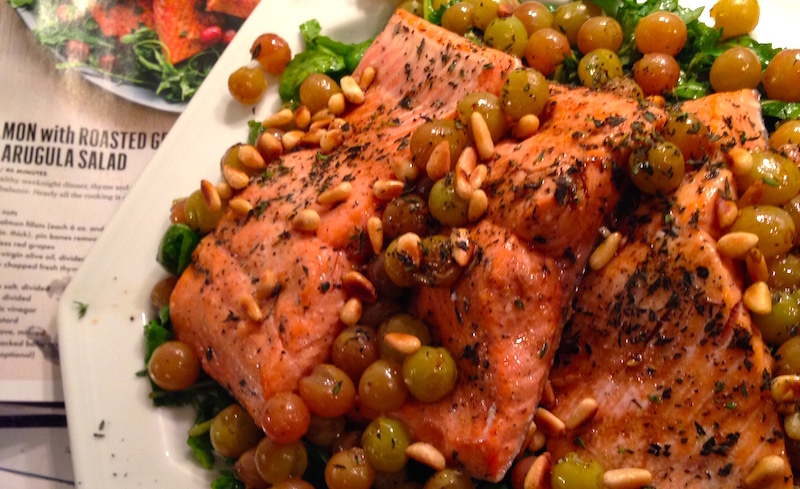 Set salmon and grapes on a rimmed baking sheet, leaving some space around fish. Drizzle everything with 1 tbsp. oil and sprinkle with 1 tsp. thyme and 1/4 tsp. each salt and pepper. Turn fish and grapes to coat, setting salmon skin side down if fillets have skin. Broil until fish is still a bit rare in center (cut to test), 4 to 6 minutes; fillets will continue to cook as they sit. Grapes should be a bit wrinkled; if not, transfer fish to a plate and broil grapes a few minutes longer. Sprinkle fish and grapes with remaining 1/2 tsp. thyme. In a small bowl, whisk together remaining 5 Tbsp. oil, 1/2 tsp. salt, and 1/4 tsp. pepper with the vinegar, mustard and garlic until emulsified. In a large bowl, toss arugula with half of pine nuts and a third of balsamic dressing. Arrange salad on a platter. Set salmon on top, overlapping pieces a bit. 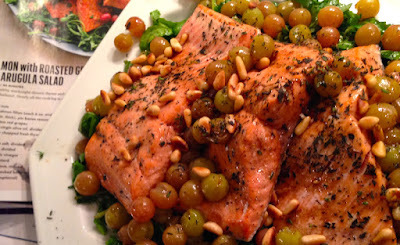 Gently combine remaining pine nuts with grapes; spoon grape mixture over fish. Serve with remaining dressing on the side and lemon wedges if you like.